Home » Videos » Andrea Bocelli Performs An Elvis Classic And Moves The Audience To Tears. Andrea Bocelli Performs An Elvis Classic And Moves The Audience To Tears. It’s a fact that we all have to face at some point in our lives—some people are simply more talented than others. That doesn’t mean that we don’t each have some sort of special or unique talent, and I like to believe that we do, but some folks just have a particular talent in the performing arts. Fortunately, the nature of performing allows us, the audience, to enjoy the talent, and of course, hard work of the brilliant performers. We come to expect certain things from certain popular performers, but sometimes they step out of their box and surprise us. In the case of this video, it resulted in a magical moment for the audience and anyone who watched the video. 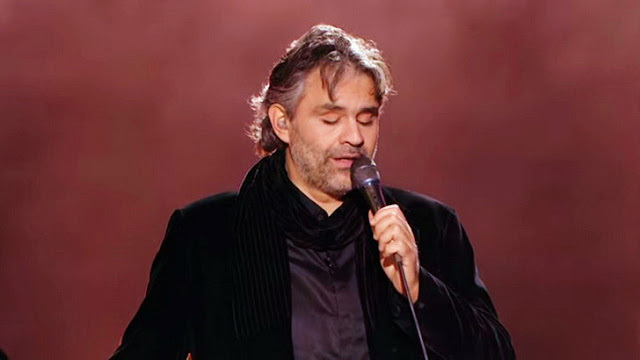 Andrea Bocelli began his career as an opera singer, specifically a classic tenor. But, no one can deny that he has plenty of musicianship outside the realm of opera; he was born with poor eyesight and diagnosed with congenital glaucoma. He lost his sight completely at the age of 12 when he was hit with the ball during a soccer match. But many years before his final loss of vision, Andrea had discovered a talent and love for music. This would take him very far and not only would he take the opera world by storm, he became famous and a widely celebrated cross-over artist. But, all the talent and experience in the world does not necessarily mean that an artist can cover one of the most recognizable songs of all time. Elvis’ “Can’t Help Falling In Love” is a well-loved song and Elvis’ fans are loyal. But, while performing in Las Vegas, Bocelli decided to take on the iconic tune. Even from the first moments, it’s obvious that he will do the song justice, and more. Watch the video below to see his full performance. Please like and share this fabulous rendition with family and friends! This post was republished from metaspoon.com You can find the original post here.